Spherification is a “Molecular Gastronomy” technique for making small edible spheres out of just about anything. Since my first flavor sphere experience I’ve wanted to learn more and make my own. Stir a quantity of Sodium Alginate into the target mixture for your spheres. Fill a dropper or small squeeze bottle with the alginate mixture. Drip the mixture into a bath of calcium chloride in water. The droplets will become spheres. But it wasn’t that easy. I chose to start with alcohol and I had a hard time blending the sodium alginate into amaretto. They just didn’t want to mix and my repeated attempts to blend them resulted in lots of air bubbles in the mixture. Worse, when I dropped the amaretto/alginate mixture into my calcium bath it splattered on the surface and spread out into a thin film. Fail. I had read that others had more luck using “Reverse Spherification” with alcohol. I gave this a try but I could only produce large amorphous non-spheres by dunking a spoon of the mixture in the bath. Dropping from any height had the same issue as above. Also note, reverse spherification is done with calcium lactate gluconate and NOT calcium chloride. I tried. You don’t want the taste of calcium chloride in your spheres! A slotted spoon (with slots small enough that you can pick up your spheres). A squeeze bottle or plastic syringe. Blend sodium alginate and 125g (about 1/2 C) of water with an immersion blender. Set aside for a couple of hours to let bubbles disperse. Meanwhile, make a calcium chloride bath, with 1.5g calcium chloride to 1C water*. I usually make 2 cups to fill a medium bowl. After most of the bubbles have dispersed, add a small quantity (perhaps 1/8th) of the sodium alginate / water mixture to the amaretto. Mix with a spoon or small wisk. 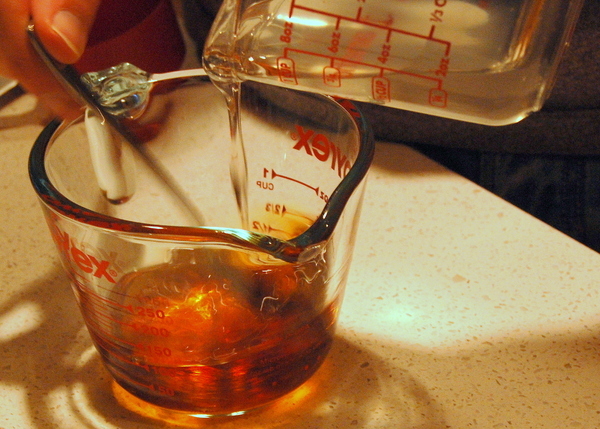 Load some of the amaretto mixture into a dropper or squeeze bottle and test. If the drop disperses on the surface of the bath, clean it off the surface, add more of the alginate mixture to the amaretto and try again. Once the spheres start to hold together, you’re all set. The longer the sphere sits in the bath, the more the alginate and calcium will react so you’ll get thicker walls. Remove spheres from the bath within a few seconds to prevent the whole sphere from going solid. Dip in a water bath. Slosh around. Remove from water and use within a few minutes. I’ve found that the contents of the spheres leach out if they’re left to sit for some time. You want to use them as soon as you can to preserve color and flavor. * Some people insist on using distilled water for the bath, since impurities in tap water might prevent the alginate and calcium from bonding. I took this suggestion and haven’t yet experimented with tap water. Sodium alginate is useful both for creating the bonds that form a membrane around your spheres and for thickening your target mixture. Your mixture will need to be thick enough to break the surface tension of the calcium chloride bath. Dropping height matters. Again, it’s all about breaking the surface tension. Experiment by dropping from different heights. Dropping height can determine whether you break the surface and dictate the shape of your spheres. While creating an alginate suspension in water makes it easier to introduce alginate into your target ingredient, it will water it down. This recipe provides a 1.6% alginate solution. A thicker solution can provide a similar result while adding less water.